Sat., Oct. 1, 2016, 9:58 p.m.
CHASKA, Minn. – The Americans are making all the right moves in this Ryder Cup. Europe was riding the momentum as it inched within one point Saturday at Hazeltine. U.S. captain Davis Love III heard conflicting ideas on the radio and by text message from his assistant captains, all of them weighing in with the best lineup for the final session of team matches. The question was Patrick Reed and Jordan Spieth, the only Americans who had yet to sit out. “I finally just said to Tiger, `Are we playing them or are we sitting them?’ He said, `No, you have to send them back out there,“’ Love said. Reed delivered another moment sure to burnish his growing Ryder Cup reputation. He was at his bullish best in the anchor match with Jordan Spieth, taking over with great shots and chest-thumping cheers that set the tone for his team and put the Americans on the verge – again – of winning back the cup. “He’s Captain America for us,” Spieth said after their 2-and-1 victory over Henrik Stenson and Justin Rose, securing a 9 1/2-6 1/2 lead. The Americans need only five points from 12 singles matches to win the Ryder Cup for the first time since 2008, and only the third time in the last two decades. Their biggest challenge now might be history. 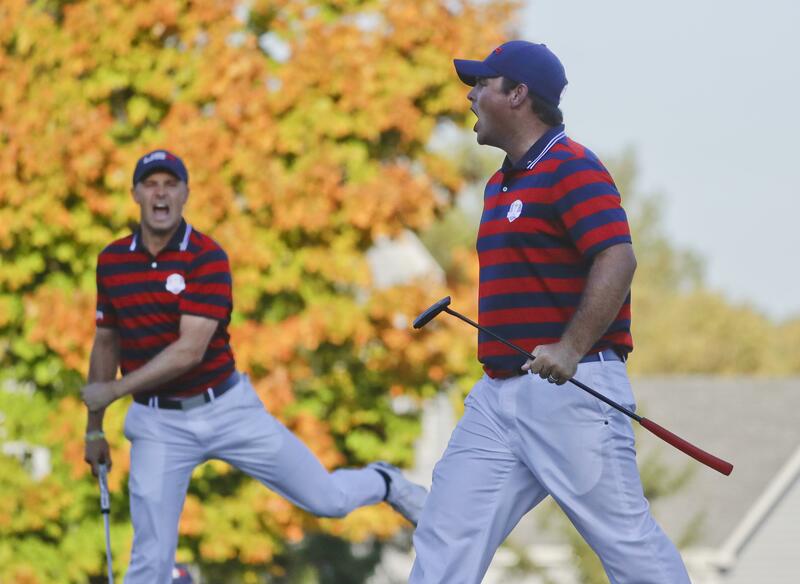 They led 10-6 four years ago at Medinah when Europe put together a staggering display of putting and produced the largest comeback by a visiting team in Ryder Cup history. The Europeans refer to that as the “Miracle at Medinah,” and they might need another one Sunday. The raucous and at times rude crowd at Hazeltine won’t have to wait long to get fired up. Leading off the singles is Reed against Rory McIlroy, who along with Belgian rookie Thomas Pieters has done his part to keep Europe close. McIlroy and Pieters were undefeated as a tandem, combining to go 11-under par in 17 holes of a 3-and-1 victory over Dustin Johnson and Brooks Koepka for the lone European point in fourballs. McIlroy shouted “C’MON!” with every putt, even staring at the crowd and daring them to hurl insults, boo or throw anything else his way. “It’s a tough environment for us to come and play in. We expect that,” McIlroy said. “It’s same for the U.S. guys when they come to play in Europe. You have to keep your concentration out there. It’s been a long day and sometimes emotions run high. … The more they shouted, the better we played. Published: Oct. 1, 2016, 9:58 p.m.